The New York Giants will head into the 2019 NFL with a lot of young talent on defense. The Giants will almost certainly be investing in an elite defensive prospect with the 6th overall pick in the 2019 NFL Draft. However, this is not the only draft pick that the Giants can find a defensive centerpiece. The Giants also have the 17th overall pick in the draft. They received this pick by trading away Odell Beckham Jr. to the Cleveland Browns. This draft pick gives the Giants tons of options in the draft. The Giants will likely try to fit a big need with the 17th pick. One big need that the Giants have is at cornerback. The Giants do have Janoris Jenkins still, but it is likely that 2019 will be his last year in Big Blue. The Giants have other cornerbacks on the roster, but they are all young, unproven, developmental players. Grant Haley showed promise in his rookie season, but Sam Beal missed his rookie season with a shoulder injury. Since the Giants are trying to get young at the cornerback position, it would not be surprising if they drafted a cornerback with the 17th overall pick in the 2019 NFL Draft. If the Giants draft a cornerback with the 17th pick, they should draft Greedy Williams. Greedy Williams is a tall, athletic cornerback out of LSU. Lousiana State University has produced some great NFL defensive backs recently (Patrick Peterson, Tyrann Mathieu), and Greedy seems to be the next great prospect in line. 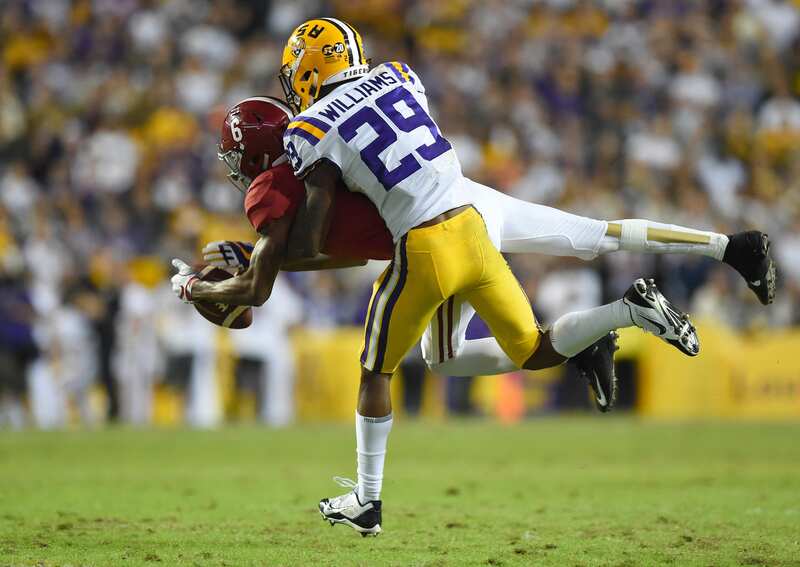 Greedy Williams was not the most statistically productive cornerback in his 2018 collegiate season, however, he has plenty of traits that will make NFL scouts fall in love with him. Greedy has more than ideal size for his position. At 6 feet 2 inches, 185 pounds, Williams will be a physical cornerback who can match up with any receiver. Greedy’s size is just the start and not the end of his physical gifts. Williams is also an incredibly gifted athlete. He showed off his elite speed at the 2019 NFL Scouting Combine with a 4.37s 40-yard dash. This speed was always on full display in college. Greedy matched up with plenty of vertical threats and shut them down. In 2017, Greedy Williams was a true playmaker. He totaled 38 tackles, 1.5 tackles for loss, 6 interceptions, and 10 passes defended. Greedy did take a step back in 2018 with only 2 interceptions but still flashed his potential on numerous occasions. Greedy Williams could bring some great physicality and energy to the Giants’ secondary. The Giants would instantly improve their defense by drafting Williams. With his length, speed, and physicality, Greedy will be an instant-impact player once he gets in the league.